Crafted with the same essence as traditional Japanese cookware, our ceramic combo burrs are design tested through three professional grade inspections to last 5x's longer than stainless steel blades. As seen on NBC, CBS, ABC, and FOX! "Extremely happy with my decision to buy!" 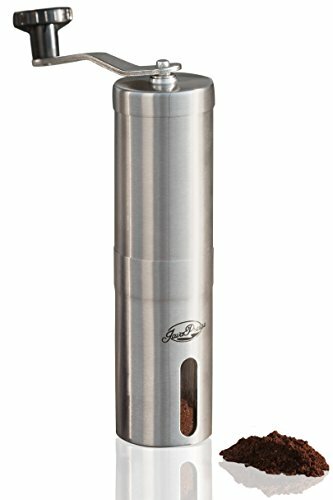 "Very impressed with the design and quality" "One of the best options for any coffee drinker" "Tempted to toss my metal power grinder and opt for this one full time" "My coffee tastes so much better!" 1.) Quality Tested Multiple Times - The ceramic burr part of our manual coffee grinder was researched vigorously against the competition to prove that it provides the best and most precise grind available. 2.) Take it anywhere - Our manual coffee grinder is not only small enough to fit in a handbag, but can be taken apart to save space as you travel anywhere. Live your life, and we'll accommodate. 3.) Built for convenience - Easy-to-clean, ergonomic, and built for any coffee maker in the world. We designed this with you in mind. 4.) Comprehensive guide included - Comes with an all-inclusive guide to help you use your coffee grinder for any style or brand of coffee known to man. 5.) Guaranteed to satisfy - JavaPresse offers a 365 Day Money-Back Guarantee for the manual coffee grinder on top of what Amazon already offers. If you are not happy, we will refund your money in full. 6.) Loving customer service - Specialty coffee is our lives. We cherish the bond between our customers and their coffee, and we make it our top priority to see you happy. What Our Customers Say: "5 stars well deserved" "This manual coffee grinder is awesome" "Top notch, quality built, easy to take apart and clean" "Far exceeded my expectations" "Perfect for the office" "Ended up buying 2 extra grinders the next week for gifts!" Order while supplies last. Limited Stock.